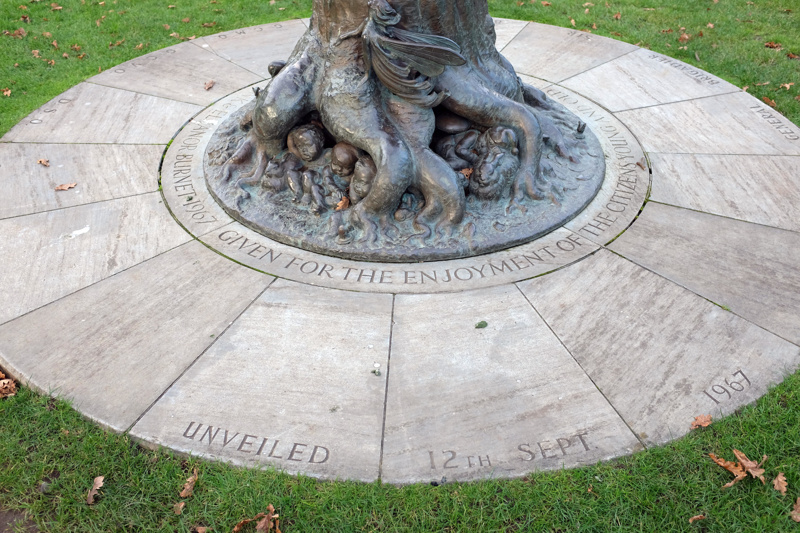 Bronze statue of Peter Pan on a tree stump with New Zealand fauna and other characters from J.M. Barrie's plays and stories. The Peter Pan statue in Virginia Lake is one of two versions made by Cecil Thomas some fifty years ago. 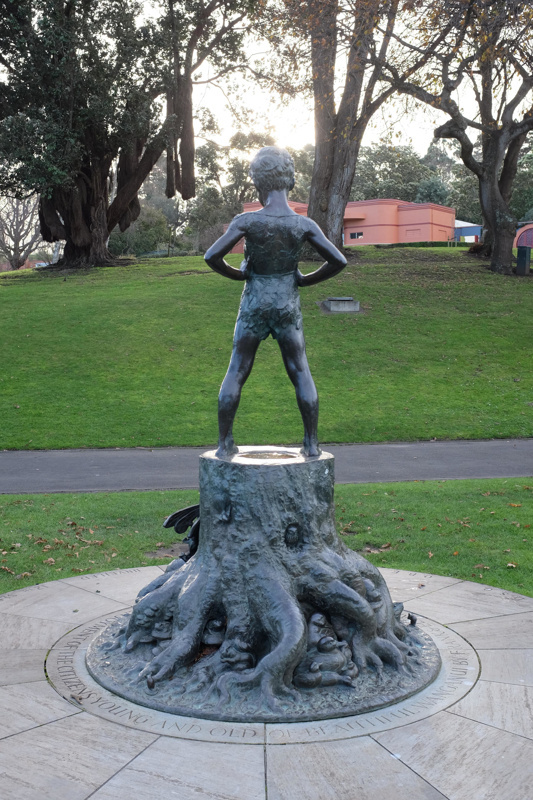 The earlier copy was commissioned in 1965 as the Dunedin Botanic Gardens' first statue. Cecil Thomas (O.B.E., F.R.B.S.) was an English sculptor, selected due to his then contemporary prominence having designed the effigy on the Queen Elizabeth II Coronation Medal, among other achievements. Whanganui residents Frank and Eleanor Burnet were inspired to commission a unique statue for the town by the same artist. Thomas visited the town, and over a period of several years, sculpted a new Peter Pan to stand in Virginia Lake. The unveiling took place in September 1967 in a ceremony presided over by Governor General Sir Bernard Fergusson. Peter was designed to be child friendly, posed defiantly with hands on hips, on a strengthened bronze beech tree stump. 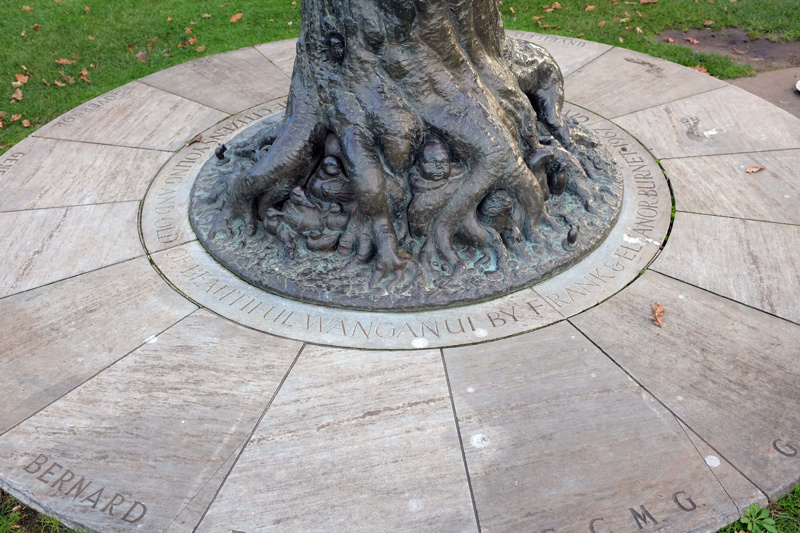 Around the stump are the Lost Boys and Thomas has chosen to incorporate uniquely New Zealand creatures which Dunedin's statue did not feature - snails, penguins, a limpet, a fantail, a morepork, skink and a tuatara. The plinth was carved from Tākaka stone.